A.S. Roma (Associazione Sportiva Roma) was founded in 1927, a permanent participant since then in the top Italian football league, except in the 1950-51 season. Its triumphs include three A Series championships, nine Italian Cups and one Inter-Cities Fairs Cup, as well as reaching the finals of the European Cup and UEFA Cup, being one of the most historic teams in the Calcio league. 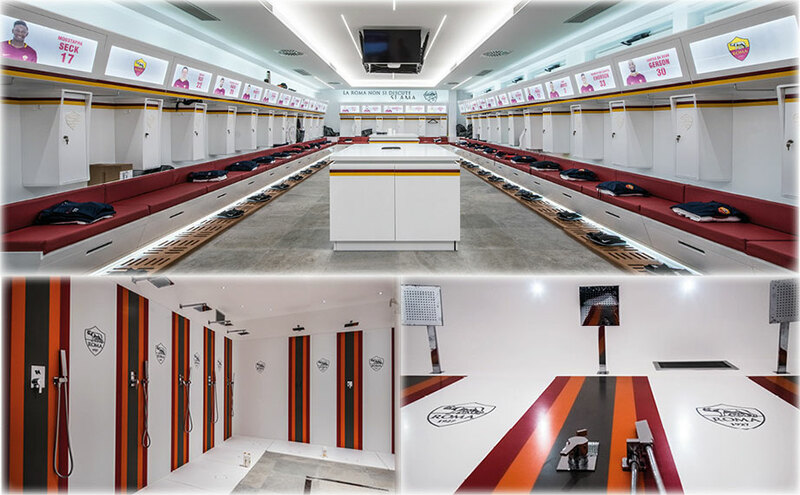 All categories of this emblematic club, including the first team, train at the Trigoria Sports Centre, where PORCELANOSA Group has formed part of the renovation of different spaces such as the changing room and shower area, with KRION® as one of the materials selected. The competitive spirit and values of the club are perfectly matched with the interests of KRION®: effort, dedication and care for details. The characteristic colours of A.S. Roma have also been perfectly combined with the KRION® 6401 Red Fire, 6301 Fruit and 6904 Bright colours. We can find KRION® in coverings with vertical strips, with the colours of A.S. Roma and 1100 Snow White in the logos of the club, embedded with a watermark in the 6905 Bright colour. SYSTEMPOOL has participated with Arquitect and Land Stone shower trays and Yove shower screens. The countertops are also created with the Solid Surface from PORCELANOSA Group, KRION®.